The little documentary that could, "Superheroes: We Work for Tips" has had three successful screenings in 2006! First up was Film Independent's Cinema Lounge in January. Paul was on hand to answer questions and talk about the film. Even Superman himself showed up to show off his new suit. Apparently, the crafty Supe purchased the very outfit Christopher Reeve wore in "Superman III" when he was EVIL SUPERMAN. He looked pretty sharp and was, as ever, a big hit. Check out the photos section for all the action pics! In February, Paul went to Boulder City, NV to represent the film at the Dam Short Film Festival. It was the only humorous documentary in the bunch. People get so dam serious when they make docs. The film was very well received and Paul made contact with some great filmmakers from all over the country. Check out a few pictures (and an Elvis spotting) from the event at the photos link. Most recently, "Superheroes" was part of Theflux.tv's online iPod Film Festival. Although we didn't win in the Indie Film category, we were one of three "Editor's Picks". The staff knew quality, even though we couldn't win the popularity contest. Download the iPod version of "Superheroes" here! All this as the movie approaches 31,000 hits at iFilm.com. Check it out, for the love of god, if you haven't yet! 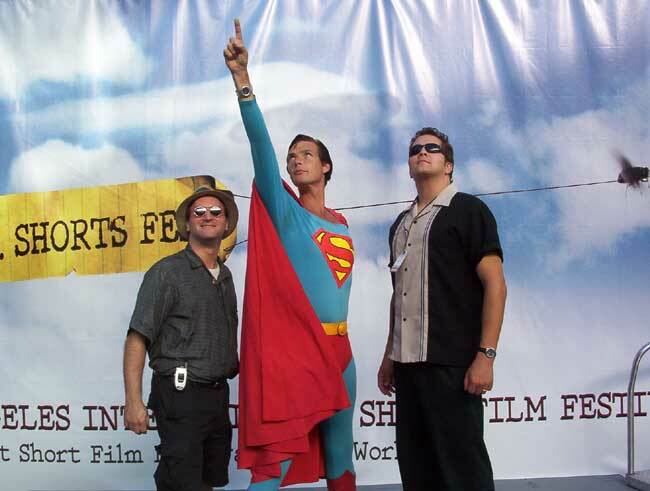 On Saturday, September 11, 2004, the Cattle Productions crew headed for the Arclight Theater in Hollywood to watch the screening of "Superheroes: We Work For Tips" for the LA Shorts Fest. Superman joined them in full costume, while Wonder Woman and Spiderman tagged along incognito. Batman stood his ground in front of Mann's Chinese Theater that day. As you can see, the Cattle Productions crew had a blast, and even had the chance to run into Penn Gillette, of all people. More photos are in the Photo Gallery. Of course, you can always see "Superheroes: We Work For Tips" for free at iFilm. Also, Paul & Rob are working on a longer cut of "Superheroes: We Work For Tips". Come back often for updates! The groundwork for Cattle Productions was laid in the late 1980's. Paul Preston & Rob Nejman have turned what started out as goofy college antics into a successful production company. Whether it was the musical venture (a la Spinal Tap) known as Hate Male that rocked Western New York for appearances at such NYC clubs as Stand Up New York, Paul & Rob were honing the tools of their craft for what would later become Cattle Productions. Reuniting in Los Angeles, CA, the duo quickly got back to the work that they do best, and in 2004 they completed work on a short documentary movie called "Superheroes: We Work For Tips". The film was promptly accepted into the Fifth Annual Tromadance Film Festival and also took the award for Best Documentary at the Universal Studios Employee Film Festival. Currently, the movie is featured at www.ifilm.com. Another Cattle Productions specialty is live comedy. The group has been doing a string of mock telethons at Improv Olympic in Hollywood, CA. The first of these shows took place on March 17, 2004. Since the event happened on St. Patrick's Day and the goal was to raise money for a leper colony in Lackawanna, NY, the show was aptly titled "LeperCon". It was a variety show featuring the talents of Paul, Rob, Jack Voorhies, Karen Volpe, Vanessa Whitney, Bethany Pagliolo, C. Stephen Foster, David Beach, George Willis, John Fulton & Toby Fulp. Since the show brought the house down, the boys decided to throw another mock benefit called "Raise the Roof". What they did to the Lepers they would now do to the Amish. "Not that they're diseased, but there's something certainly wrong with them." And a good time was had by all.